'You will be amazed, enthralled and certainly amused by the tales that Duncan recounts. You will raise an eyebrow or two (more than once!). ...a unique insight into contemporary exploration. Let the entertainment begin...' Extract from the introduction by Martyn Farr. Duncan's curiosity has got him into a lot of tight spots - quite literally! As a teenager, Duncan really wanted to be an astronaut but took to the exploration of inner space instead. Only a dozen men might have stood on the moon but Duncan has squeezed into many places that no one has ever been before, and some places that no one is ever likely to go again (probably for a very good reason). These memoirs recount the author's misadventures during his thirty-year involvement with caving and cave diving beginning with student antics in the caves of the Mendip Hills to a hair raising escape from deep beneath an English stately home. Along the way we are treated to the ups and downs of subterranean enterprise - from the joys of discovering new caves to the sadness of losing close friends. Duncan tells his tales with characteristic candour, often making light of difficult situations: rock falls, serious illness and an embarrassing incident with a tick. There are tears and laughter, often at the same time: who else would perform an animal impression with a suspected metatarsal fracture? About the author: Duncan has been involved in many discoveries including helping to establish a new British cave diving depth record at Wookey Hole Caves in 2005. 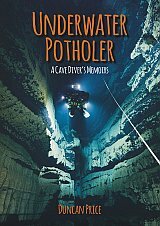 He is the co-author of a number of books including Cave Diving Group Manual and the award-winning WOOKEY HOLE: 75 years of cave diving & exploration.